This is simply a state of fact: cyberspace has gotten bigger — and bigger, and bigger — and massive. It’s gotten so big that you can practically harness memory for your business files, pictures, everything — all online! Sort of changes the game in terms of storage for your small business now, doesn’t it? Case in point: examples of that would be Google Docs, Windows SkyDrive, Yahoo’s ZumoDrive. These are all online storage centers. If you have a hotmail or gmail or Yahoo account, you’ve got memory to store basically anything you want — online! No worries about losing your business files, no worries about corrupted documents or whatnot. Take this revolutionary state of technology now and employ it into something extraordinary, all thanks to the mega-giant Google. What is this innovation? It’s called…. Say a big thank-you to Google’s remarkable online browser — probably the leader in browser technology — Google Chrome. In my opinion, it beats the Internet Explorer, the Mozilla FireFox — basically all of them. 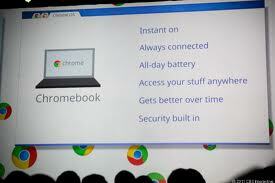 Chrome has become so efficient that Google has even released something extraordinary: the Chromebook. You’re looking basically at a ready-made laptop with Chrome built in, utilizing this storage web technology to its fullest. Imagine a laptop with literally no storage memory! 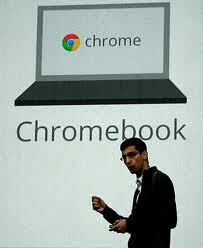 That’s the Chromebook. Now imagine just how fast this little laptop is. Very fast. The memory Chrome uses falls right into the Google Plus, the tons of storage available for photos, documents, everything. It’s all there on your Google account. Because of the web utilization, you’re looking at an automatic login to any WiFi or 3G broadband signal for your internet connection the very moment your Chromebook boots up. Like I said, fast. Fast and easy! Moreover, once you open up that Chromebook, your booting time literally counts to only eight seconds. How’s that for efficiency? Makes you think of the possibilities in your office, right? Even better, your Chromebook is so user-friendly that it can be passed from employee to employee with ease. Because all the content exists right online. There are no hard drives! It’s Hard to Pass Up, But…. How efficient your internet works on any given day will effect the quality of your usage through, say, Google Docs. Don’t get me wrong, though; while the instant save feature of Google Docs prevents any mishap of losing your work due to a snafu with the internet connection, using Microsoft Word or Excel online is still different than using the same software on a computer’s hard drive! Simply try it out for yourself. It’s something you would have to get used to. That should tell you something about the quality Chromebook has for entrepreneurs. It’s fast. It’s easy. It’s efficient. It’s cost-effective. And for small businesses, you can’t beat that! This entry was posted in Employees, Small Business, Virtual Office and tagged Chrome, Chromebook, computers, efficiency, entrepreneur, Google, small businesses, technology by Pierre. Bookmark the permalink.